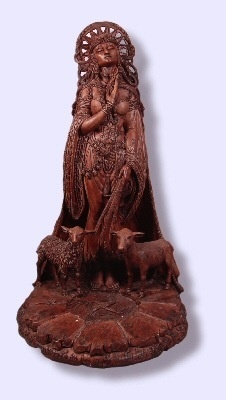 The Celtic Goddess Brigid is beloved as the muse of poetic inspiration and the mistress of the healing arts. She is also associated with smithcraft, which held special import for the early Celts. The site of her well still exists in Ireland, and its eternal flame is still quietly attended by eighteen maidens. The Catholic Church made her a saint due to her fervent worshippers, who accepted Christ, but could not endorse a religion that excluded her. 10 1/2"" resin statue, wood color finish.